Details emerge about a new Echo Park home goods store and deli, an Eagle Rock restaurateur makes a Golden Globes appearance and praise for a Boyle Heights bean-and-cheese burrito. 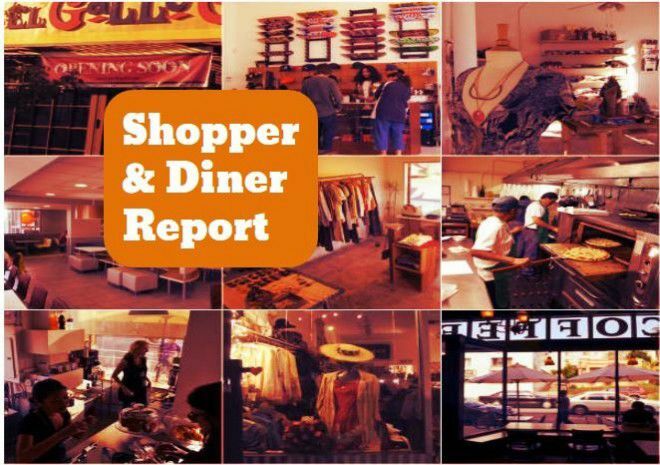 Read on for this week’s roundup of Eastside dining and shopping news. Gareth Kantner, owner of Dinette in Echo Park is expanding his enterprise, Eater LA reports. The expansion has been in the making for quite some time, initially with small scale sidewalk café Dinette. Now he’s almost ready to launch his next two concepts located adjacent to Dinette. On the forefront is a home goods store that offers a bit more than your typical home goods store, such copper spades, shovels and dim sum steamers, deli meats, breads and a bar with adult beverages that serve as an extra dining area for Dinette. A full-service restaurant called Libre is hidden in the back of building. The home goods store is unofficially slated to open in February while Libre is expected to open late spring to summer. No word on Libre’s menu as of yet. Dinette is located at 1608 Sunset Blvd. in Los Angeles. George’s Burger Stand in Boyle Heights has crafted an old-school bean and cheese burrito to call its own, Los Angeles Magazine reports. Owner Armando de la Torre Jr, who also operates the taco-centric Guisados, strived to develop a bean burrito and salsa that levels up to the classic neighborhood Mexican taco spot, Al & Bea’s on 1st Street. George’s Burger Stand is at 2311 E. Cesar Chavez Ave. in Boyle Heights. Lots of changes have headed down the path of Echo Park’s Brite Spot as of late. First, the 60-year-old diner underwent new ownership last September. Now, the new owners have elected for the return of dinner service, which has not been offered for the past few years, a company email reports. Then there’s the new blue and white sign…Dinner service returns on Monday, January 14. The Brite Spot is at 1918 Sunset Blvd. in Echo Park. Francisco Ramirez, whose La Princesita sold tortillas to high-end restaurants as well as neighborhood residents, died from a heart attack at age 64, said the L.A. Times. Even as his East L.A. company grew, Ramirez made tortillas the old fashioned way, with stone-ground nixtamalized corn. “He didn’t care if you were someone in the neighborhood or a high-end restaurant — you were a customer, and that’s what mattered,” said his daughter Mavel. XL3 Vintage Clothing has left its Echo Park location. What’s taking over the space? We’ll keep you posted. XL3 Vintage Clothing was located at 1832 W. Sunset Blvd. in Echo Park. El Prado appears to be changing owners. The Echo Park bar’s beer and wine license is being transferred to a company controlled by Nicholas Fisher from the current owners, who includes Mitchell Frank, founder of The Echo nightclub across the street, reports The Eastsider. El Prado is at 1805 Sunset Blvd. Producer Alexis Martin Woodall and the creative crew behind “The Assassination of Gianni Versace: American Crime Story” took to the stage on Sunday night to accept the 2019 Golden Globe in the limited TV series/TV movie category. But Martin Woodall is not only a Hollywood producer. As The Boulevard Sentinel noted, she is also co-owner of the Eagle Rock restaurant Red Herring with her husband, chef Dave Woodall. “Dining out is a privilege,” Martin Woodall said in a 2016 interview. “It should be an experience, as opposed to a theatrical production. And comfort food can be an experience. It doesn’t have to be one or the other.” Red Herring is at 1661 Colorado Blvd.